Now more than ever, leaders, organizations and individuals need an understanding and application of Emotional Intelligence and Communication Skills to increase effectiveness under pressure and to maximize human capital. To succeed professionally and personally in these challenging times, you have to understand yourself, your uniqueness, and how to fully access your multiple intelligences. 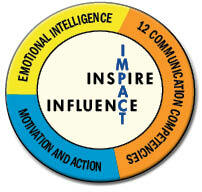 You need to understand how you interact with others and how to maximize your influence. Breakthrough to Excellence focuses on developing personal power, dealing with turbulent times, and creating a culture of innovation, loyalty and competitive advantage, while fostering honest and open communication. This is achieved in the workshop through an understanding of Emotional Intelligence and Communication Skills Mastery. $685 includes workshop, breakfast and lunch each day, and workshop materials.